Call for Special Issue Proposals: see details here. 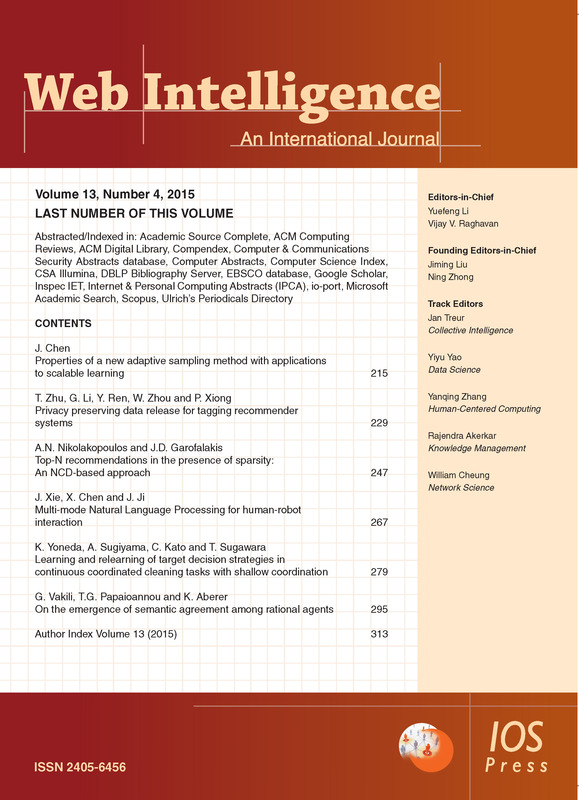 Web Intelligence (WI) is an official journal of the Web Intelligence Consortium (WIC), an international organization dedicated to promoting collaborative scientific research and industrial development in the era of Web intelligence. WI seeks to collaborate with major societies and international conferences in the field. WI is a peer-reviewed journal, which publishes four issues a year, in both online and print form. WI aims to achieve a multi-disciplinary balance between research advances in theories and methods usually associated with Collective Intelligence, Data Science, Human-Centric Computing, Knowledge Management, and Network Science. It is committed to publishing research that both deepen the understanding of computational, logical, cognitive, physical, and social foundations of the future Web, and enable the development and application of technologies based on Web intelligence. The journal features high-quality, original research papers (including state-of-the-art reviews), brief papers, and letters in all theoretical and technology areas that make up the field of WI.